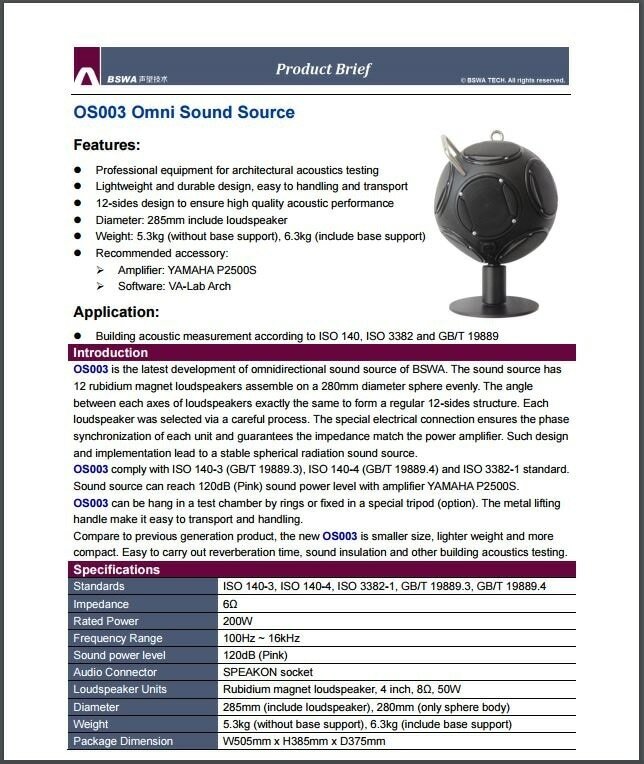 OS003 is the latest development of omnidirectional sound source of BSWA. The sound source has 12 rubidium magnet loudspeakers assemble on a 280mm diameter sphere evenly. The angle between each axes of loudspeakers exactly the same to form a regular 12-sides structure. Each loudspeaker was selected via a careful process. The special electrical connection ensures the phase synchronization of each unit and guarantees the impedance match the power amplifier. Such design and implementation lead to a stable spherical radiation sound source. OS003 comply with ISO 140-3 (GB/T 19889.3), ISO 140-4 (GB/T 19889.4) and ISO 3382-1 standard. Sound source can reach 120dB (Pink) sound power level with amplifier YAMAHA P2500S. OS003 can be hang in a test chamber by rings or fixed in a special tripod (option). The metal lifting handle make it easy to transport and handling. Compared to previous generation product, the new OS003 is smaller size, lighter weight and more compact. Easy to carry out reverberation time, sound insulation and other building acoustics testing.